In May I had the opportunity to attend the BlogHer Food conference in Atlanta. There were many informative sessions run by some very well known and much admired bloggers. Hopefully you have noticed some improvements to my blog and these are a direct result of that conference. Thank you BlogHer Food! One of the events at the conference was going to the Sweet Auburn Market. It was invigorating to get out of the hotel and into the Georgia sunshine. I enjoyed meandering this historic market and seeing all of the wonderful and different array of food and comparing it to the markets in the Midwest. While waiting for the bus to go back to the conference, I met a wonderful fellow blogger from Chattanooga, Tennessee. Her name is Cara, and her blog is, The Boys Made Me Do It. I told her about this blog and how I’m trying to inspire families and friends to eat a “real” meal that is made with care and cooked with love at least once a week. She loved the idea of the blog, and I asked if she would like to give me a family recipe and a story to post on Return to Sunday Supper. She gladly agreed and a bit later sent this recipe to me from her mother’s recipe box from the 1970’s. We didn’t know it at the time, but Cara and I have something in common because both of our mothers worked outside the home. Her mother didn’t have time to grow her own herbs or run to the farmer’s market, so when her mother prepared this recipe she used ingredients that any grocery store would have. 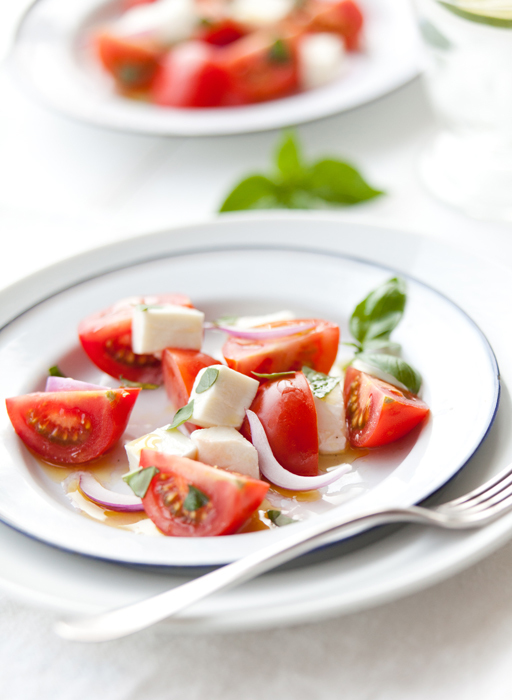 So, if you can’t find fresh mozzarella, use packaged. 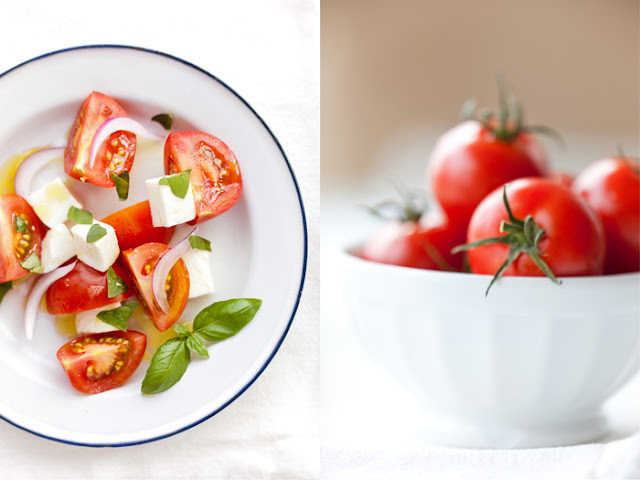 If you can’t find cherry tomatoes, use whatever fresh tomatoes that are at your store. Most grocery stores that I’ve been into lately has fresh basil, but if you’re really in a pinch, use dried. When I adapted Cara’s mother’s recipe I was able to get gorgeous, just picked tomatoes from the market and fresh mozzarella and basil so that is what you see here. I also made a few adjustments because I was using fresh mozzarella and I have noted these changes below. Cara explained that this salad was one of her summer favorites. Her mother made it often and the flavors take her back to summers in West Virginia. Isn’t it wonderful how when we smell and taste something our mother’s made it instantly transports us to another time and place? 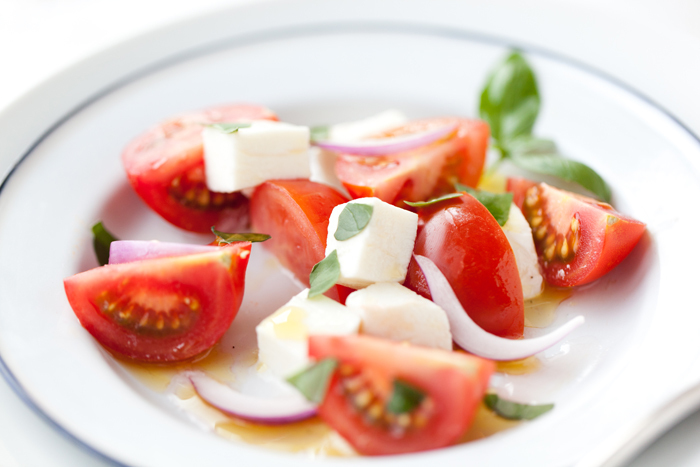 Do you have a special summer supper memory and recipe? I’d love if you could find the time to share them with me. Please send your story and a recipe to me, Susie@returntosundaysupper.com. I used slightly larger tomatoes, and all fresh ingredients. I also made the vinaigrette separately and added it right before serving. If you use fresh mozzarella, I would suggest that you serve this salad right away. I found that the fresh mozzarella got a bit tough the second day. In a medium bowl mix together the vinegar, garlic, salt and pepper. Then slowly pour in olive oil till blended. Add tomatoes, mozzarella, onion and basil. Toss to mix. Salad is best served cold and can be kept in the refrigerator up to 2 days. Thank you so much for allowing me to share a family recipe! The post is absolutely fabulous! I love this salad! Thank you so much for sharing. Love your Idea of bringing the family back together!